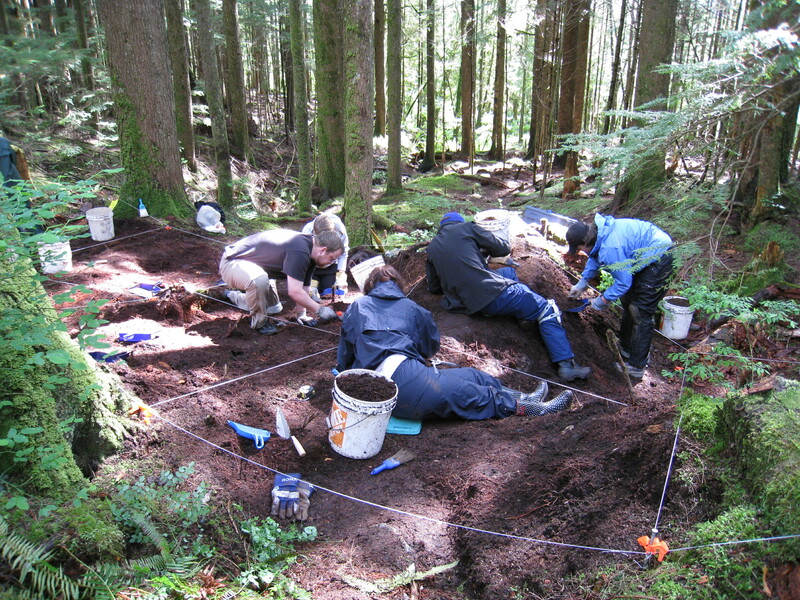 I had the pleasure of visiting the Capilano University Archaeology Field School at one of their sites in the Seymour watershed (North Vancouver) this morning. 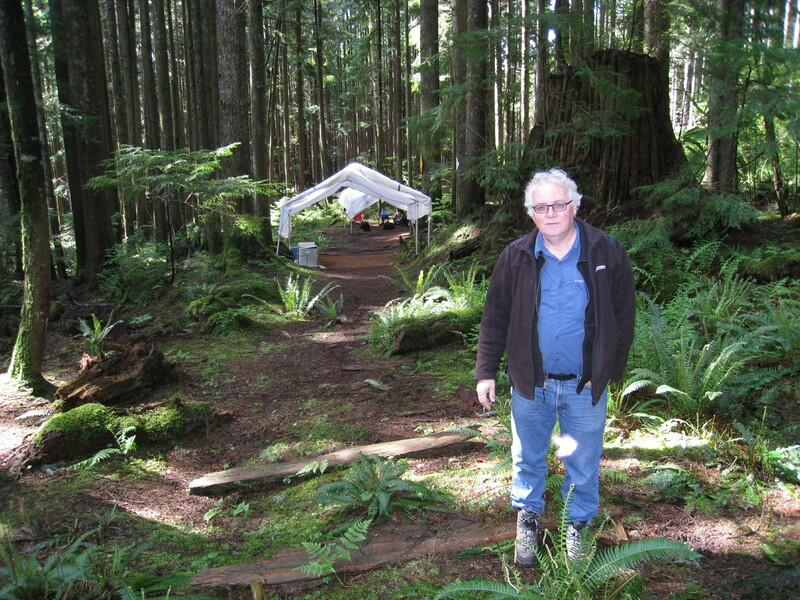 In its twelfth year, and always under the direction of Bob Muckle, the Field School is unearthing a Japanese history in the forests of Vancouver’s north shore. 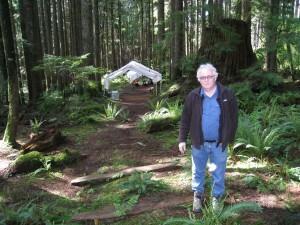 The site is a logging camp which dates to the 1920s. There is increasing evidence that some people lived at the site through the 1930s and, presumably, to the internment of Japanese people in 1942. Muckle runs a tight ship and if I learned anything about archaeology field schools today it’s that they are places for the stout and hearty (yes, Bob, beer words). They are not places for whining, as was evident by the keen and focused conversations during the pre-earth scraping chatter, the morning briefing, under the cozy tents (Figure 1). BC archaeologists work in the rain, I learned too, and often without the aid of rain gear. If only we cultural types were so driven. But if whining is not permitted, enthusiasm certainly is – and it was in abundance at the site. Approximately every 4 minutes and 35 seconds something came out out of the ground. A hand up, a call for Bob, a quick but careful evaluation and a pronouncement: ‘Yes! It’s an artifact. Bag it separately.’ Or, ‘No! Another piece of glass. Put it it in the level bag.’ The moment by moment excitement of an historical archaeology dig was palpable, infectious, and has me considering broadening my anthropological training. 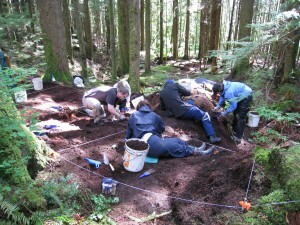 The Capilano Archaeology Field School is fun. It fosters team-work and camaraderie. Despite the gruff demeanor, Bob likes it that way. It gets the best out of the students, he tells me. Clearly there are messages here for the ethnographic field school I am developing: fun, educational, good-natured, no whining, enthusiasm, and a work ethic result in success. I can only hope to be so lucky. This was written by Tad McIlwraith. Posted on Wednesday, May 19, 2010, at 8:06 pm. Filed under Academia, Anth Subfields, Archaeology, History, Methods, Teaching. Bookmark the permalink. Follow comments here with the RSS feed. Both comments and trackbacks are currently closed. Thanks for writing such a lovely post! You are very well written, (which sounds cocky coming from a mere student with no writing background), and it was a pleasure (and funny) to read. Thank you, also, for making photos available on flickr. The other day I didn’t have a chance to put up my photos because I stupidly forgot my camera at the site, but there are some up now including one of Bob and yourself (that I so sneakily took).